One of the most noticeable consumer-facing changes in the new version of Apple’s mobile operating system, iOS 6, is the updated App Store application for iPhone, iPod Touch and iPad. Apple chose not to focus on the changes during this morning’s announcement – perhaps because details were already revealed thanks to developer leaks showing the new user interface in action. But the App Store has received a major overhaul worth mentioning. It now prominently showcases the “Genius” app recommendation section, and more controversially, now uses a card-like mechanism for browsing through the applications themselves. However, while users will be focused on the new look and feel of the App Store app when iOS 6 rolls out later this month, some of the most critical changes affecting developers have been taking place behind the scenes. Early data shows that the integration of the technology from Apple acquisition Chomp hasn’t just affected the front-end – algorithm tweaks which impact app rankings are also a part of the new package. First, the new look: in iOS 6, the App Store application has removed the “Categories” button from the app’s main screen, in favor of “Genius.” This is a remarkable change, when you stop and think about it, as Apple is now directing users to trust in Apple’s search and recommendations over category browsing. It’s a move that’s almost reminiscent of the time when we stopped locating websites via directories, and turned to search engines instead. With some 700,000+ applications in the App Store, now seems to be a good time to begin directing users to new discovery mechanisms as well. The introduction of the card-like browsing feature, too, fits in with this directional shift. Users “flipping” through the cards aren’t as likely to search as long or as deep into the results – just like users rarely end up on page five of Google’s search results. That means developers will have to focus their efforts more on optimizing for “ASO” (app store optimization), the way web publishers rely on SEO. Before Apple bought them, Chomp touted its proprietary algorithms that worked to compile a more complete description of the app from all the information available on the App Store alongside mentions and other actions on Twitter, Facebook, blogs, and websites. The company spent years developing its app search formula, which included 11 patents on the search technologies and user experiences it had developed. Now, with the newly added Facebook “Like” button for apps in the iOS 6 App Store, Apple is able to feed a strong signal directly into the algorithm it uses to determine an app’s social popularity. That being said, making “social” work for apps will be a challenge. “All evidence points to the observations that mobile apps…aren’t social,” says Matthaus Krzykowski, co-founder of app search firm Xyologic. “If Apple makes it work with Genius for mobile apps, then it will be a first in our industry,” he adds, noting that Genius for music has generally failed. But social is only one of the signals Genius will use, it will also track things like whether or not users press the “not interested” button under the app suggestions, for example. How this will affect app rankings won’t be fully be understood until iOS 6 goes live and millions of users start pouring in new signals for the ranking algorithms to react to. But according to early data from SearchMan, a 500 Startups-backed app analytics firm, the App Store recently saw another algorithm change which has affected several well-known brands. This is related to the tweaks the algorithm already saw in June, which appears to have utilized Chomp’s technology to better understand what words mean and how they’re related. It wouldn’t be off base to assume that Apple may be using some form of NLP (natural language processing) to help better understand users’ search intent. Most users don’t know what to type in into the search box, says Krzykowski, which is also why Chomp’s “suggested searches” was one of the company’s key features, previously. In SearchMan’s analysis, the company took two snapshots of app store data – one from early June and another from September 6th. 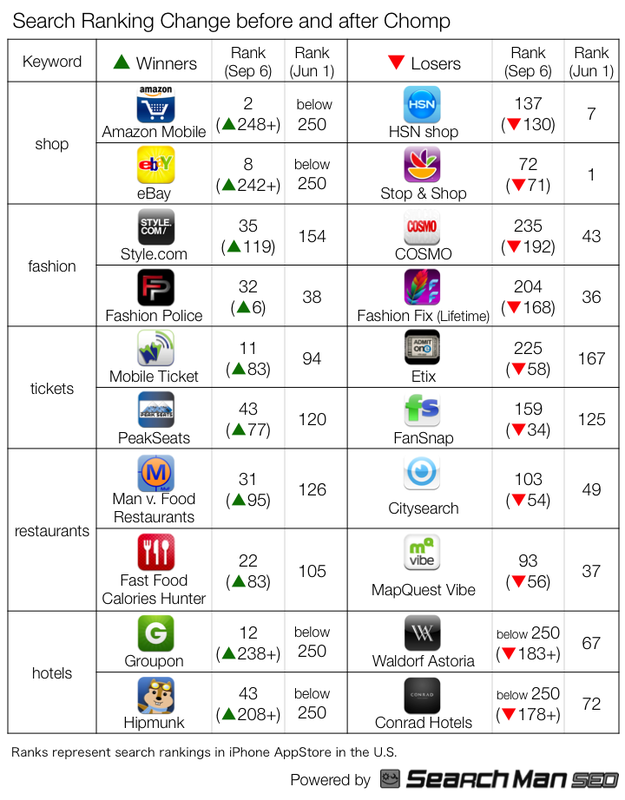 Although the apps it chose to examine are only a very small sliver of the overall App Store, it’s clear that the Chomp integration is already impacting rankings for some big brands. Following a similar analysis the firm did for the Japanese market, SearchMan found that in Shopping verticals, dominant retailers and e-tailers like Amazon and eBay gained in search visibility, while those with older business models like Home Shopping Network and Shop & Stop lost ground. The trend to favor newer companies was spotted again as older web ticketers like eTix and FanSnap dropped in rankings and mobile ticket centric companies like Mobile Ticket and PeakTicket gained. In fashion, Cosmo and Lifetime Network’s Fashion Fix lost ground as others like Style.com and Fashion Police extended their respective brands to mobile. Specialized restaurant finders like Man vs. Food and Fast Food Calorie Hunter grew and older generalists like Citysearch and MapQuest lost. In travel, aggregators and deal finders like Groupon and Hipmunk grew, while individual brands like Waldorf Astoria and Conrad lost. It’s hard to say for sure how much Chomp’s technology is at play here, versus other post-Chomp tweaks and everyday adjustments that affect rankings. But on top of the earlier shifts spotted in June, it’s clear that the way rankings have historically worked may be changing quite a bit in the new App Store going forward.